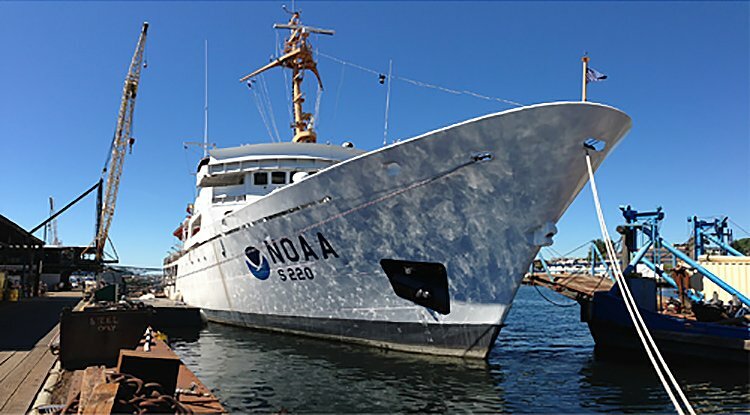 The NOAA Ship FAIRWEATHER underwent significant alterations at Lake Union Dry Dock in Seattle, WA. Alterations included replacing the existing survey boat davits with new, higher lift capacity davits, and as a result, the ’01 Deck was significantly modified and extended. JMS was tasked by NOAA to perform an inclining test on the ship, once the work was completed, in order to update the lightship weight and center of gravity and to revise the intact and damage stability analysis. JMS was to perform the inclining test within a restricted time frame in order to generate the results, and submit the incline analysis to ABS with sufficient time for the vessel to return to service without delay. After the inclining test was completed, JMS immediately requested a preliminary review and approval of the results from ABS. This preliminary approval allowed the ship to re-enter service and maintain its tight science mission schedule. JMS finalized the analysis and submitted a revised Trim & Stability booklet to ABS within the permitted 90 day period. JMS was also tasked to investigate digital inclinometer and digital hydrometer devices and how the use of advanced instrumentation may aid in the performance of inclining tests, and through their use, improve the accuracy of the results obtained. JMS performed an industry market survey and recommended a series of devices to NOAA for their benefits of improved accuracy as well as robustness in the shipyard environment. Unfortunately, due to the shipyard schedule, none of the digital hydrometers or inclinometers could be delivered by the manufactures in time for the FAIRWEATHER inclining test, so JMS used its own inclinometer to conduct the inclining test on the ship. At the conclusion of the experiment and analysis, JMS generated an Instrument Investigation Report summarizing the pros and cons of using digital hydrometers and inclinometers in an inclining test. This report considered the various benefits and pitfalls of using modern digital instruments for collecting data in an inclining test and highlighted where these instruments might be of both a technical benefit and practical benefit in the incline test process.